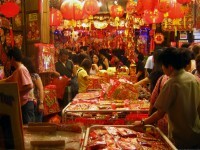 The Chinese New Year is undoubtedly the most celebrated event by the Chinese. It is celebrated in the first 15 days of the Chinese lunar year. In Malaysia, the first 2 days is a Public Holiday (except for Terengganu and Kelantan where only the first day is a public holiday). The dates every year is different, but it will always fall between the 21st of January and 20th of February. It is often celebrated with the start of Spring, which falls on February 4th. According to Chinese folklore, there was a man-eating beast "Nian" which came out to prey on humans every 12 months, close to winter. The people later believed that it was afraid of loud noises and the colour red, hence the people started making loud noises and lighting fireworks, and the use of red colour for decorations. These days, preparation starts weeks before the new year. Chinese families will clean the house from top to bottom, decorate the house with banners, red lanterns, chinese caligraphic writings and paper/plastic fireworks. Many, kids in particular, will buy new clothes to usher in the new year. The eve is probably the most people look forward to. Family members, near and far, will return for the family reunion dinner. Therefore, there will be an exodus of people returning to their hometown. People usually make travel arrangements weeks, sometimes months before the new year. The dinner is usually held the home of the most senior member of the family. At the stroke of midnight, the New Year is ushered in. In the days before firecrackers were banned, people will light endless length of firecrackers. Often, the noise won't stop till the wee hours of the morning. These days, firecrackers are banned in Malaysia. However, don't expect it to be anywhere near silent as many will start playing music and instruments besides cheering to celebrate the new year. The first day of the New Year is where people will visit family, relatives and friends. Some will have an open house and invite friends, Chinese and non-Chinese alike. Guests often give oranges which symbolises gold or wealth. 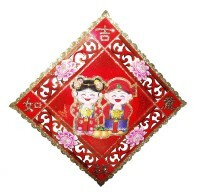 Married couples and the elderly will give unmarried people red packets, Ang Pow (Hokkien) or Hong Bao (Mandarin). These packets contain money, and usually has to be even in number. Children in particular are often very enthusiastic on visiting friends and relatives and they will get to receive extra Ang Pows. The second day of the New Year is for married daughters to visit their parents. After getting married off, the daughters often do not have much time to visit their parents. The seventh day of the New Year, is known as "ren ri", the common man's birthday. This is the day that everyone aged a year. It is also the day where people will eat a dish called yee sang, a mixture of raw fish, shredded vegetables, crackers, herbs and sauces. Everybody will join in to toss it, and it is said that the higher you toss it, the longer you will live. The eighth day is particularly important to Hokkiens, as they will offer thanks giving prayers to Tian Gong, the God of Heaven. This will often extend to the ninth day. The last day of the New Year, the 15th day, is commonly known as Chap Goh Meh (Hokkien). It is also regarded as the Chinese Valentine's Day. Female singles will throw oranges with their name written on it (in modern days, it also includes their phone number) into the water and male singles will pick it up. Popular places in Malaysia where this occur are along Gurney Drive in Penang and in the Taman Jaya park in Petaling Jaya. During the entire Chinese New Year festivities, Lion Dance troupes will roam around performing at houses, offices, hotels and shopping complexes. 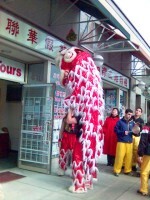 It is said that the Lion Dance will ward off evil spirits. The dance is a spectacular event, where two performers, one the head and the other the tail, will perform acrobatic stunts. This often involving grabbing ang pows hanged high above. The dance is accompanied by loud drums and cymbals. Some performers will also carve out fruits, usually a pamelo, into beautiful ornaments.